If you've ever spent the night in the dead of winter listening to your teeth rattle and praying for dawn, the Western Mountaineering Lynx MF was made for you. Warmth in abundance is the catch-phrase here: the -10° Lynx is capable of safely getting you through truly abominable temperatures in remarkable comfort. This isn't just a little extra warmth compared to a 15° bag—it's like wrapping yourself in an electric blanket and cranking up the dial. 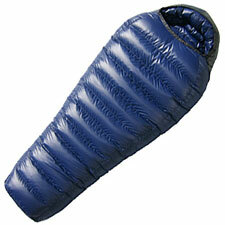 Western Mountaineering says the Lynx features eight inches of loft, calling it "a bombshell of warmth!" The Lynx puffs up so luxuriously thick you'll feel ready to move into an igloo. At three pounds, two ounces, the Lynx is comparable in weight to most 0° down bags, making it one of the lightest sleeping bags you can find with this level of insulation. In order to avoid overheating, most sleepers will probably only want the Lynx when overnight temperatures are at least dropping down below freezing. That said, the Lynx does feature a full-length zipper, allowing you to sprawl out as temperatures climb, or even unzip the bag completely and use it as a down comforter—mighty nice. Realistically, I don't carry my Lynx very often, preferring instead to use my lighter and much less Helium bag. But every time I shiver, you can bet I'm thinking about the Lynx. This is an excellent choice for extra cold weather. And, in today's era of off-shore manufacturing, Western Mountaineering is a true anomaly: these bags are made in the USA, and their quality is unmatched.